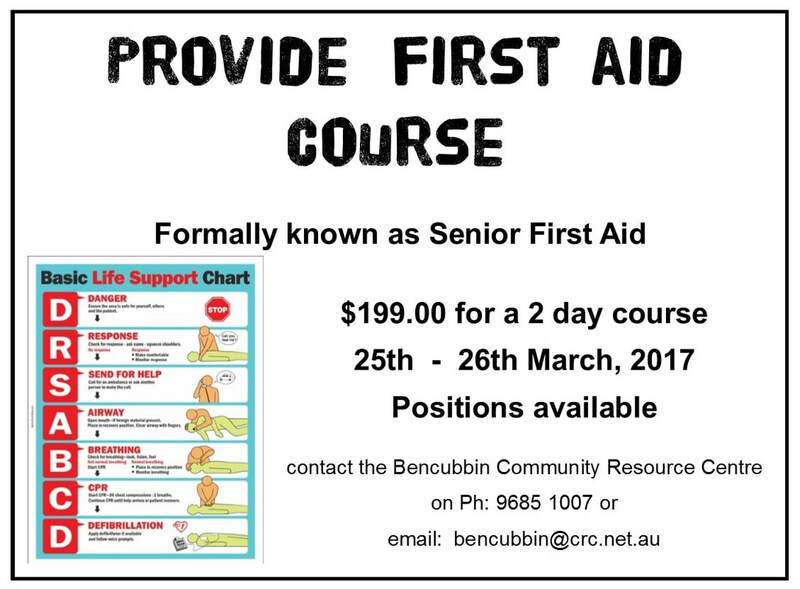 We held another first aid course in Bencubbin. We had about 8 people attend this course and they all past. 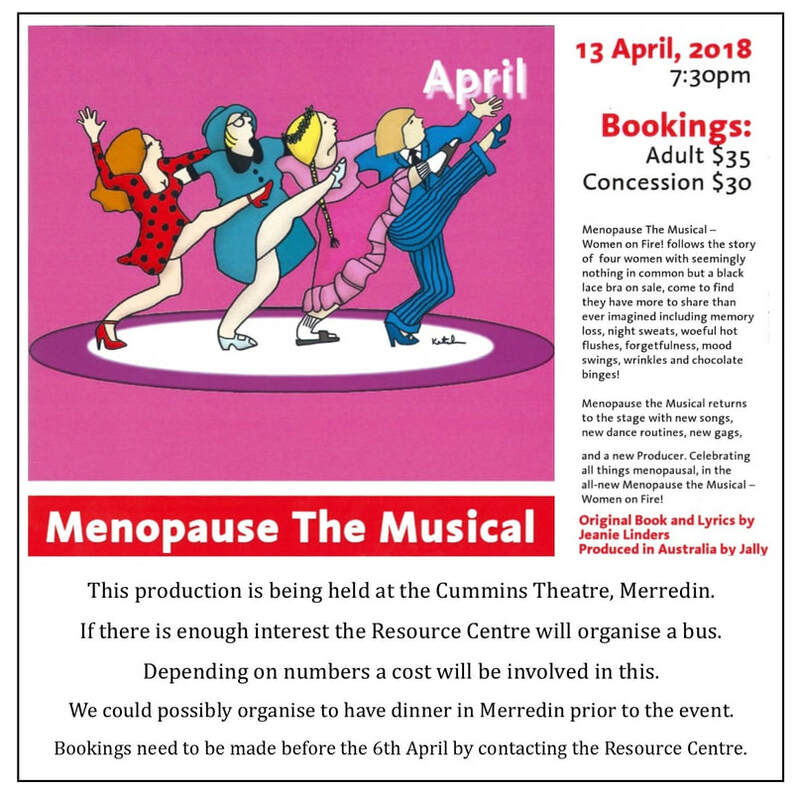 Menopause The Musical, was a funny musical that was about Menopause. 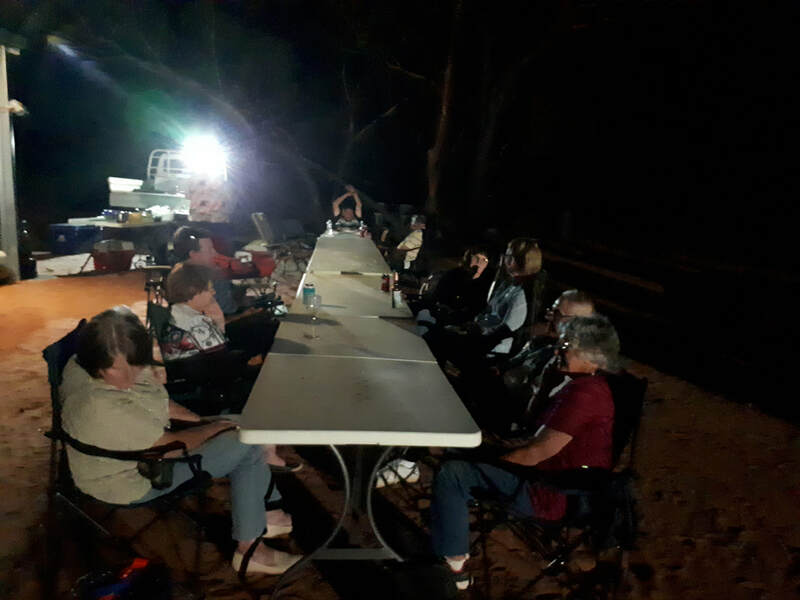 we took a bus from Bencubbin with anyone who put there name down and we drove them to Merredin, Where we had tea and enjoyed a great show. Lots of Laughs and Giggles came from the audience. It was a great night over all and everyone enjoyed themselves. The Event "Thank a Volunteer" we get some funding to hold this event. We hold this event to say thank you to the volunteers of our Community, from Ambulance Officers, Bush Fire Brigade Officers, Sporting Club representative, Community groups in the Local area and anything else we Volunteer our time for. It might be sitting down and talking to someone who just needs to talk, helping out at a busy bee. So this is one way that we say "THANK YOU" to our Local Community Members. The Seniors Christmas Lunch is like the other Seniors lunch that we hold every 3rd of 4th Friday of every month apart from January. We have Lovely people in this local Community that cook wonderful meals for them. This is a 3 course meal starting with bread and soup, them the main meal and then sweets. There can be anywhere from 10 to 20 of our senior Citizen come to this event. 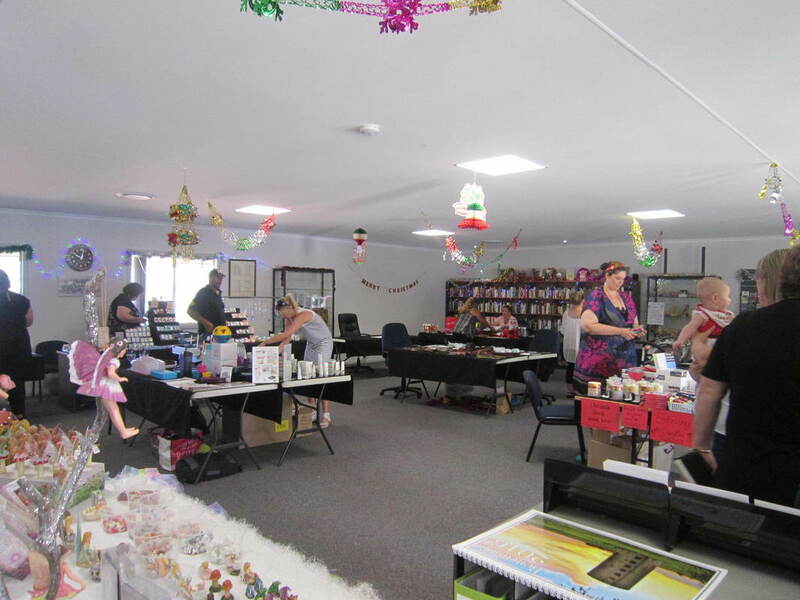 For the Christmas Lunch The Bencubbin Community Resource Centre does a roast and invite all the helpers/volunteers that have cooked the lunch for the senior through out the year, as a way to say thank you for doing this well supported event. At this event we have the School kids from the local school come down and sing Christmas song to the seniors of our Community. Food Sensations is learning about all different types of food and what foods are healthy and unhealthy for you. we had Health workers come in and told us what we needed to look for on backs of prepackaged foods that we buy. We had about 16 Females come to this event to learn to cook healthier food for their families. We try and hold a food sensations event at least 1 time a year every 1 to 2 years. 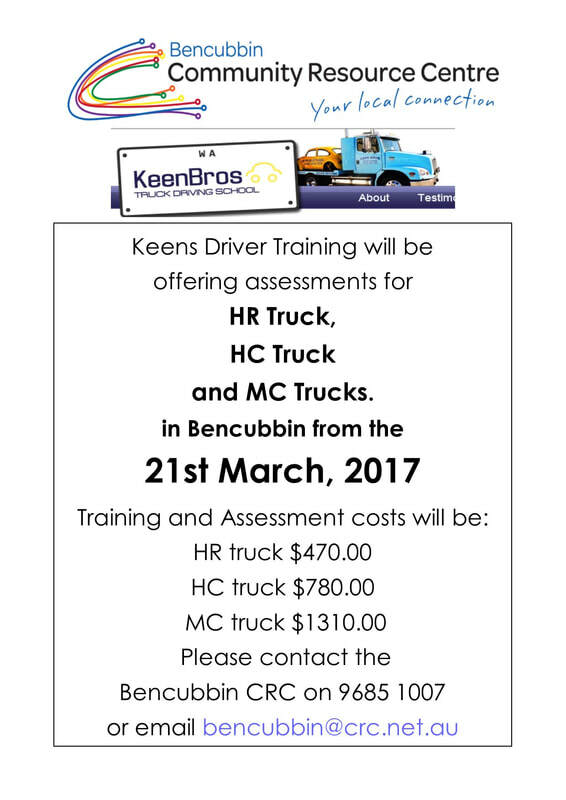 12 Guys did their Truck Driving and Assessments, held by Keen Bros Truck Licenses. Everyone Passed, with flying colours, which is good as the ones that did the HR can come back and do their MC Next year. Men's Health Night was a good turn out with 26 people turning up to it. We cooked a BBQ and made salads. Everyone had a great time talking to one another. This event was to let the Men in the Local area open up and talk to each other and to let people know that they are NOT alone, people will be there for you to talk to them. WOW!! Just WOW!! 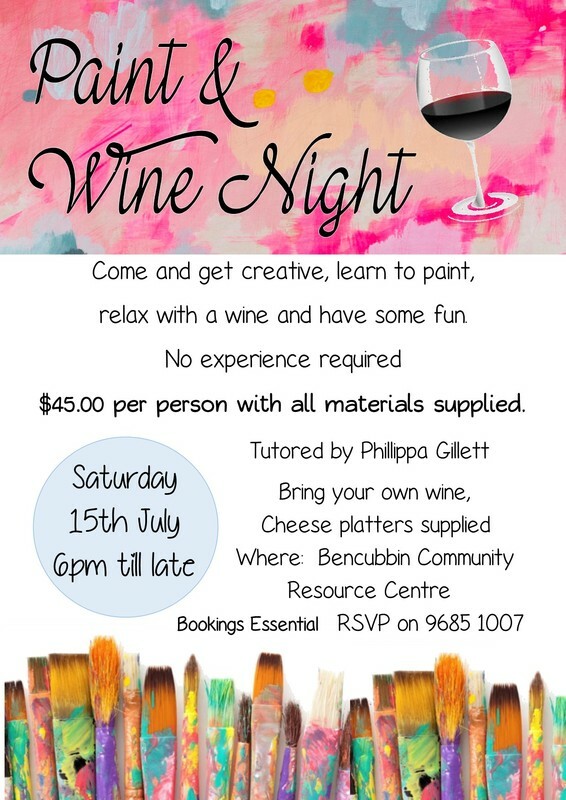 Great Event everyone had a Fantastic time, drinking and learning to paint still life. 17 people had a great time. The artwork that was painted by the locals were absolutely Fabulous. We are holding another night like this one next year. School Holiday workshops are held during the school holidays. These Workshops were Salt Painting and Textured. The kids had a blasted doing this workshop there was salt everywhere,but at least they had fun.There was 20 kids in each workshop. The Australia Biggest Morning Tea have been held at the Community Resource Centre for a couple of years. This is a great event to hold as it is raising money for Cancer, and it is a easy event to hold. There was about 40ish people turn up and donated to Cancer Council. Seniors Lunches are held every 3rd of 4th Friday of every month apart from January. We have Lovely people in this local Community that cook wonderful meals for them. This is a 3 course meal starting with bread and soup, them the main meal and then sweets. There can be anywhere from 10 to 20 of our senior Citizen come to this event. AusChem was a Chemical Course that we held for farmers in the area to get their Chemical use training. So they know how to control and managers weeds on their Property. 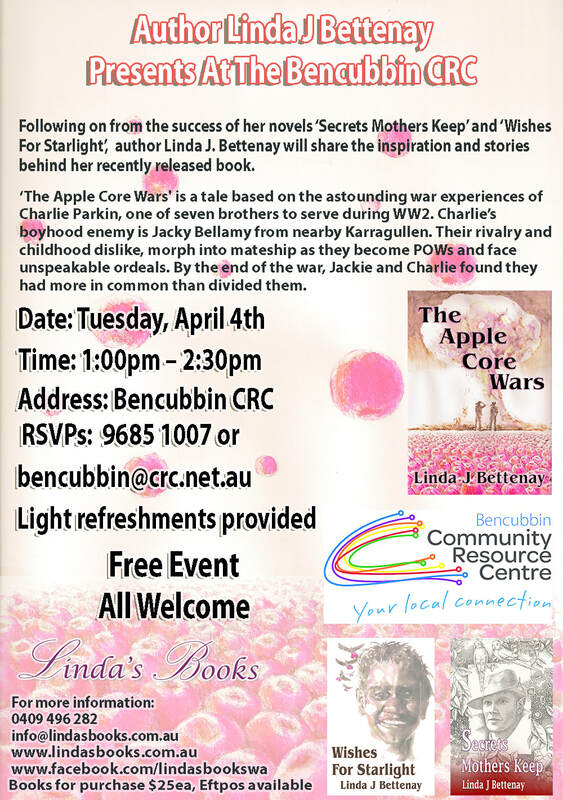 Linda Bettenay held a book reading of her new book call The Apple Core Wars. She has previously held her other 2 book readings (Secrets Mothers Keep and Wishes For Starlight) at the Community Resource Centre. Provide First Aid Course was held for people to get the senior first aid Certificate. This 2 day course gave the opportunity for 9 people to do there First Aid Certificate in there Local area. All the people how did this course Passed. Congratulation to the one how did this. Once or Twice a year we do Truck Driving Licences. This gives local people a chance to do their truck licence in the local area and they don't need to travel to Perth to do it. This is also affordable to the local people to be able to do this. Marty's Party was another Country Art Funded event. Like Trash test Dummies this event was support well by locals and surrounding towns. We had about 70 odd people for this performance. Below is the outline of what "Marty's Party" was about. ​Let’s get this Party started! Canadian comedian Marty Putz and his hit one-man show is touching down in WA. It’s an hour of funtastical craziness that comes from the depths of a weird and wonderful mind. An inventor, gadget geek and fun fanatic who turns every show into a celebration, Marty’s Party will take you on a roller coaster ride into his world of comedy chaos! With the anti-gravity cloaks and hypno-wheels, inflating suits and high diving acts, Marty’s Party can’t help but entertain the whole family. In this 60 minutes of mayhem, you’ll be hurling, ducking, screaming, laughing and lining up to volunteer. Whether you’re catching flying cats, jamming on the Rock & Roll platform or leading the charge in a grand marshmallow fight… everybody wins! With this many gizmos and gadgets, you better warm up your vocal chords and stretch your throwing arm before the show begins. This is truly a family show that lasts well beyond the performance. Not only will your laughing muscles be sore for days but your whole family will be talking about their favourite moments for months to come. PARENTAL Warning: Mum & Dad may act like a 10 year old! 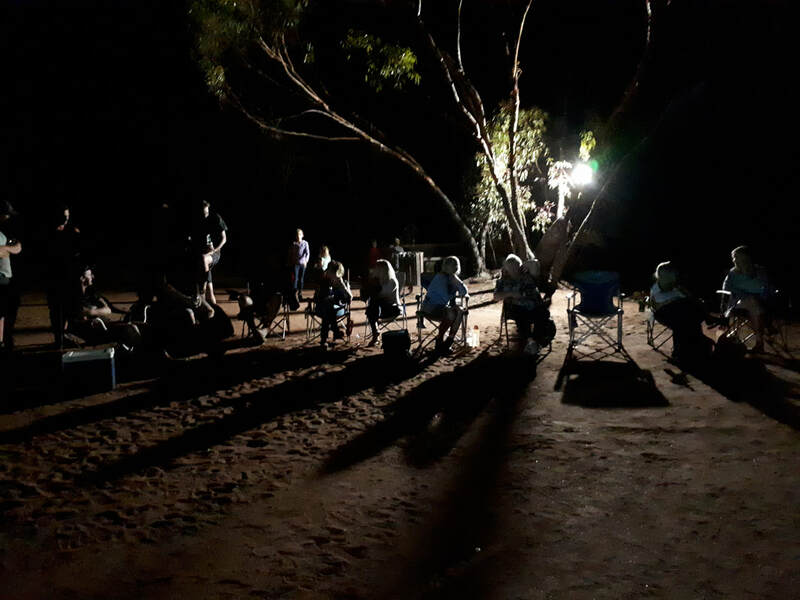 51 People turned up to spend part of the night under the stars. Everyone learned a lot about the stars and who long it take to see them on earth. Richard Tonello did a presentation about what he was going to show us with the telescopes. The sights were AMAZING!!!!! It would be great if we could hold this event again in a couple of years. We got a grant to hold a Thank a Volunteer day/night. We held a Thank a Volunteer BBQ with about 62 people turned up to this event. People sat around talking to each other and just having a good yarn. The Seniors Christmas Lunch is like the other Seniors lunch that we hold once a month, but the Christmas Lunch we do a roast and invite all the helpers/volunteers that have cooked lunch for the senior through out the year, as a way to say thank you for doing this well supported event. At this event we have the School kids from the local school come down and sing Christmas song to the seniors of out community. We held a Christmas Pop Up Shop in November, this is an opportunity for locals business in the area to show case what they have to sell, either what they have made, brought to sell on. This is a great event as it lets people in the area come and get some last minute Christmas Gift's. We had about 17 Local Stall Holders. With funding, the Community Resource Centre put on a Senior's Trip. This year they went to Dongara, they all had a blast, some of them told us that it is their highlight of the year. The Senior normally go for about 4 to 5 days, They go on tours that are booked in advance and just to move around to keep themselves active. Upstairs/Downstairs is and Cancer Awareness event that we held for women, to learn about Women's Cancer E.g. Breast Cancer, Cervical Cancer. We had a survivor of Brest cancer come in and talked about things she found out along the way and how she came to find out she had cancer. This event brought about 30 women in to a room to talk about the cancers above. 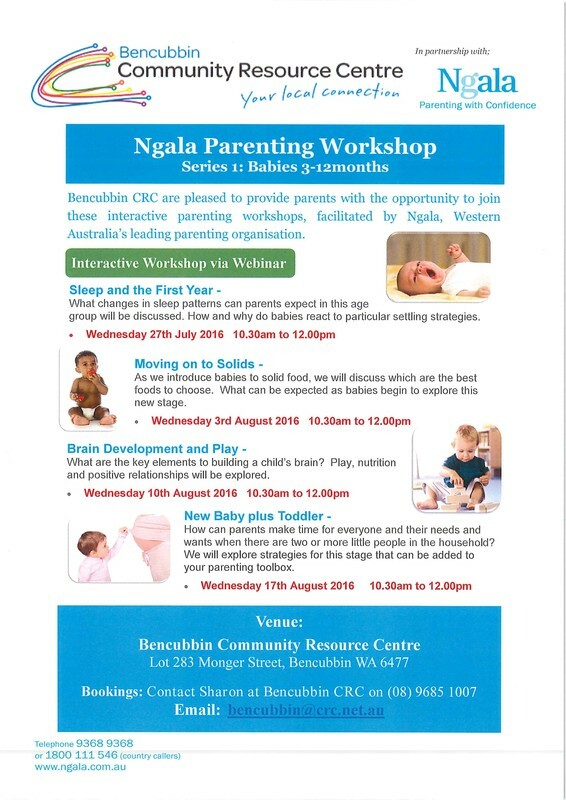 Ngala Webinar was run over 4 weeks for Mums, either New Mums with new born's or Mums that have had their 2nd or 3rd child. Ngala helped these Mums with some questions that they were unsure about. Lets face it no one know how a baby is going to come out and how to raise them as they don't bring instruction booklets with them.